The West Coast produce Expo is hosted by The Packer and Farm Journal Media. 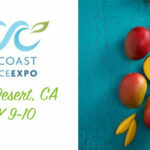 This show connects the world of produce with the West Coast buying community of retailers, food service professionals, and distributors. Participants have the opportunity to interact and unwind with the most influential produce industry experts in a professional, yet casual and fun environment. Click here for more information on the West Coast Expo.